If you’ve been reading my blog for the past couple of years, you’ll know that I adored the previous novels in this series. To All the Boys I’ve Loved Before brought the Song girls into my life with its adorable romantic comedy shenanigans; P.S. I Still Love You coaxed the complexities of teen romance to life with the complications in Lara Jean’s own. So, it’s likely not going to surprise you when I tell you that I adored Always and Forever, Lara Jean. Though it isn’t entirely necessary to read this book (or the second one, for that matter), it is an absolute delight to do so if you love Lara Jean and the people in her life as much as I do. I’ve always loved and related to Lara Jean, particularly her introvert tendencies and the preference to be at home or with her small groups of intimates. It was nice to see that she had become more confident in herself, and open to embracing experiences that weren’t necessarily her cup of tea… all while still being the girl who preferred comfort and coziness and familiarity when it comes right down to it. I genuinely enjoyed spending time with her again, as well as with her inner circle: the wonderfully sweet and devoted Peter K, her feisty little sister Kitty, her dependable older sister Margot, and their doting father who only wants the best for his girls. It was like settling in among family friends that I’ve known forever and ever to hear what has been going on with them while I was away, and I was happily ensconced in that familiarity for the entirety of the novel. The best thing about Always and Forever, Lara Jean is the way that Han integrates so many things into the actual story. The desire to live life to the fullest and to preserve all those memories. All the changes associated with figuring out where you’re going to college (should you choose to go). The shifting of family dynamics when someone new becomes a part of your lives. Another facet of first love and romance, particularly if you are one half of a high school couple. Lara Jean has a lot on her plate, to be sure, and Han wrote everything in a way that felt real and relatable. I have been where Lara Jean has been in my own life, so I liked seeing my experience reflected so perfectly. I enjoyed Always and Forever, Lara Jean. I laughed a lot, I teared up at times, I swooned more than once. I just loved being with Lara Jean one last time and seeing her through the end of her high school experience, and would 100% consider it a perfect ending for this series. 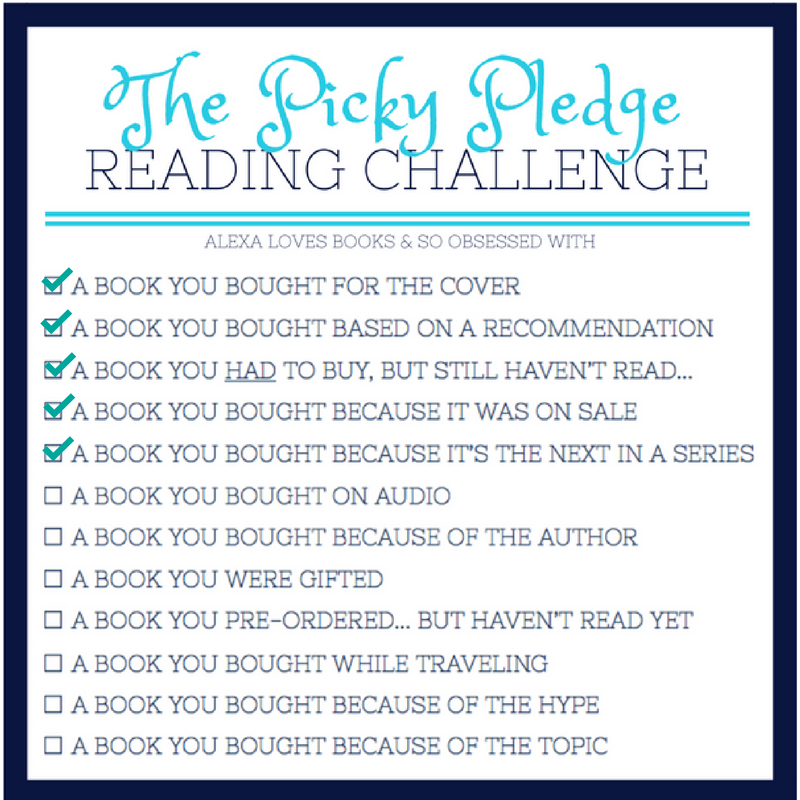 This was my fifth read for The Picky Pledge Reading Challenge! Even though I fell a wee bit behind schedule in the past couple of months, I'm pleased we were able to catch up properly for June (and do an entire week of posts). I obviously loved this book, which makes me really happy! Anyway, apart from reading one TBR book (at least) a month and reviewing it, Hannah & I are also answering a set of questions related to the month's category. 1) How long has this book been on your TBR? I pre-ordered this one, so it came in on release day! I read it nearly a whole month later, so that's probably the answer to this question - a month. 2) What made you want to keep reading the series? I love main character Lara Jean so, so much. I've always found her relatable, and loved seeing her grow and change with every book. I just needed to know how things would turn out and spend one last novel hanging out with her (and Peter) (and her family). 3) Will you continue reading this series? Sadly, this is officially the last novel in this series! If there had been more books, I probably would have read them. But I will happily reread the books that are currently published, since it's now a story that's come full circle.